Are you superstitious? I can’t say that I am but I LOVE the song Superstition by Stevie Wonder. Here, have a listen. I bet you’ll find yourself jamming right along with Mr. Wonder himself. My Friday started out a little earlier than usual, as my friend Melissa crashed here last night & had to be up bright & early for work. I got up, made her coffee & chatted with her while she got ready for work. No coffee for me, as I knew more sleep was in my future. I opted for a glass of OJ, out of my favorite drinking vessel. 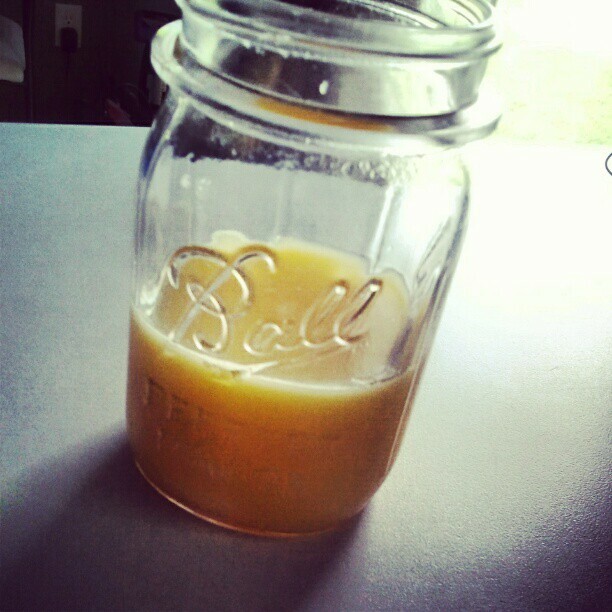 I’m seriously obsessed with mason jars lately. P.S. I can’t even tell you how excited I am that all Android users can have Instragram now. I know, I know, Facebook bought it for billions of dollars, yadda yadda yadda. I don’t care. I love it. I headed back to bed around 7:30 & snoozed until about 9:30 when I decided to start my day. Oddly enough, neither the hubby or I have much of anything planned for the day. I’ll be working from 7pm until 3 or 4am so I’ll probably just lay low most of the day in preparation for my long night ahead. 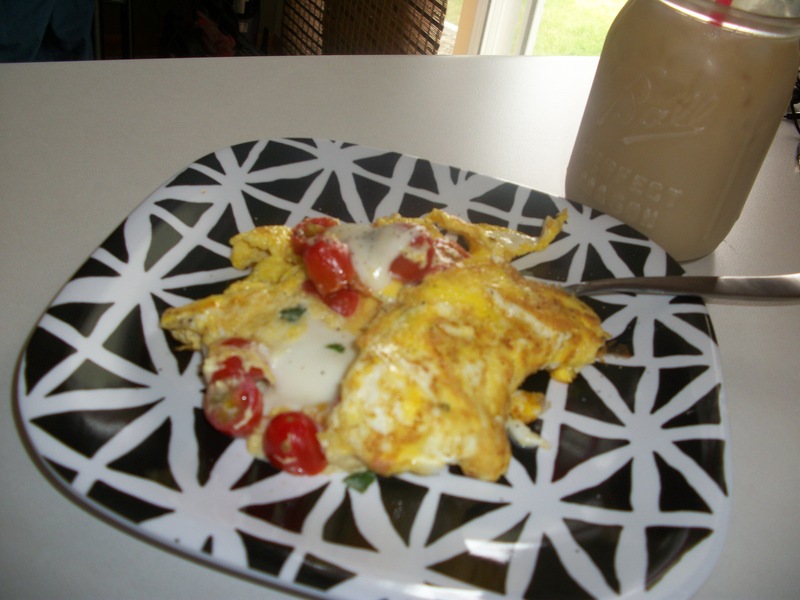 I did throw together a fantastic omelette egg mess (confession: I don’t really know how to make an omelette for real) for breakfast. Marinated mozzarella balls, fresh basil, tomatoes, yum! I was going to throw in spinach as well but I totes forgot! Making a pot of coffee for one person at 7am was perfect because then I had a mostly cooled pot for iced coffee at 10! I swear there’s coffee in there, I think I my caramel macchiatto creamer pouring hand may have been a bit heavy today. Hubby is running some errands (read: going to the DMV so I had no interest in tagging along) & stopping to pick up soup from Panera for lunch on the way home. It’s dreary with a chill in the air & the only thing that sounds good to me right now is soup. I had a bit of my new favorite snack to tide me over until it’s lunch time. Everything Pretzel Crisps with garden veggie cream cheese. 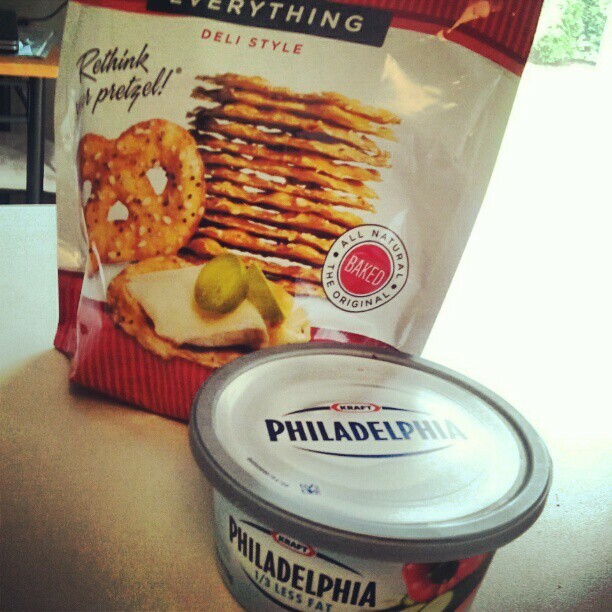 Snacktime crack! The only other thing I need to accomplish today is getting some frosting on these white chocolate cupcakes. What’s that in the center, you ask? 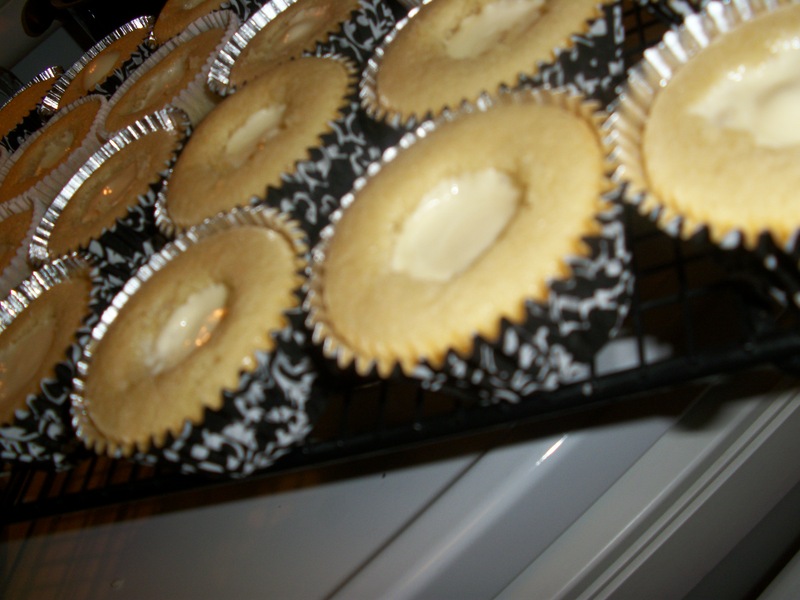 Oh, just a Lindt white chocolate truffle, inserted while the cupcake was still warm to ensure total meltiness. NBD. Has anything truly horrible ever happened to you on Friday the 13th? Do you fear the day every time it comes around?